Take part in this whacky food fight competition with a family member right here in food crazy Singapore! Dish out as much food at your rivals (another family) while avoiding getting hit with something equally delicious. Food fight has never been this fun and there’s no cleaning up to do! 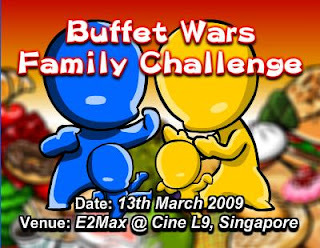 What are you waiting for, join us in the never ending food fighting fun at Buffet Wars Family Challenge! As we are based in Singapore, having events overseas would normally involve other parties. We did have events both in Indonesia and Malaysia, and we loved it! We may plan more in the future!